In addition to these members of staff, we also have a varied team of “backroom staff” who are engaged on short term contracts to carry out specific development tasks for us. These range from complex programming issues to the design / development and manufacture of hardware and other pieces of equipment. Our supplier / contractor base is drawn from around the world, including Scotland, Denmark, Holland, Dubai, Malaysia, America………. 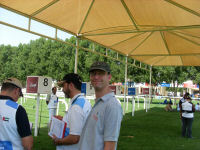 Pictured to the left is part of our support time at the 2006 Asian Games held in Doha, Qatar. Bryan founded the company in 2002. Since that time, he has sought to maintain the development of innovative technologies to enhance the sport of Endurance Horse Racing and bring more visual information to the spectators and competitors. He has a background in Clinical Podiatry and has spent many years in Senior Management roles within the public health sector including directorships in Quality Management for which he has an international reputation, having published several books and papers on the subject. 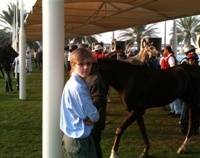 He has over 30 years experience in the Equine industry with over 20 of those years specifically involved in the Endurance discipline. Married, with one teenage son, he lives in the Highlands of Scotland where he helps his wife with their small Arab stud (when he is at home) and enjoys sailing, golf and “just sitting doing nothing”. Paul joined the board of the company in 2003, bringing with him a wealth of experience in software and I/T design. He undertakes the role of technical director on the Board and has been pivotal in taking forward many of the company’s innovative designs. Paul lives with his Partner and their three young sons in Cheshire. Craig joined us in 2006 as a consultant to develop systems to be used at the Asian games in Qatar. Since then, he has remained with us as a central part of the team , acting as software engineer and designer and a general main part of the support team at every event. Craig has a wide and varied experience in many I/T environments and brings a wealth of diversified ideas to the team. Craig lives with his partner in Cyprus. Douglas joined us in 2008 as general team support due to the increasing commitments that Raddery now enjoys. 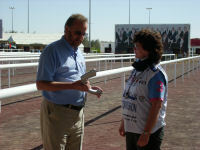 He is an experienced Horseman and qualified riding instructor. Douglas is married and lives in the Highlands of Scotland where he also runs a commercial organic market garden business. Oliver has been involved in the background of the company since it was formed. 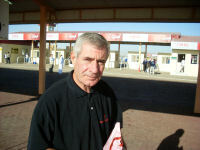 He first travelled to Abu Dhabi with his father Bryan when he was only 8 and has been visiting on and off ever since. Gradually, he has taken on responsibility at rides providing general support on the vet line and looking after the equipment as necessary. He gained his ECDL software qualification when he was only 11 and is a highly accomplished film maker having been nominated twice for a BAFTA. Richard joined the team in 2010 as general support crew. He has a technical background as a career Military man but now spends his time, having retired from the Army, breeding and successfully showing Labrador dogs.